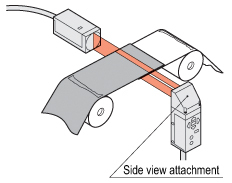 This laser collimated beam sensor conforms to the Class 1 laser stipulated in IEC 60825-1: 2001 and JIS C 6802: 2005. Hence, safety measures such as protective gear are not necessary. Four monitoring LEDs help you to easily align the emitter and the receiver. LA-511 conforms to FDA Class I. It is approved for use in U.S.A. by FDA. The side view attachment (optional) enables versatile mounting styles.